If happiness is a place, we are here to guide to you. 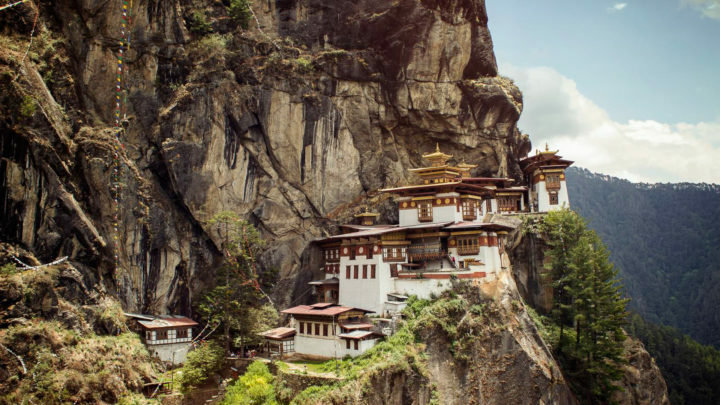 Enter Bhutan, a protected mountain kingdom wedged between India and China that bills itself as the home of happiness. It is into this Buddhist Shangri-La of 20,000-foot mountain peaks and subtropical plains that Six Senses Resorts & Spas is opening its next homage to the exotic that will give guests a true taste of life in this remote heavenly kingdom. 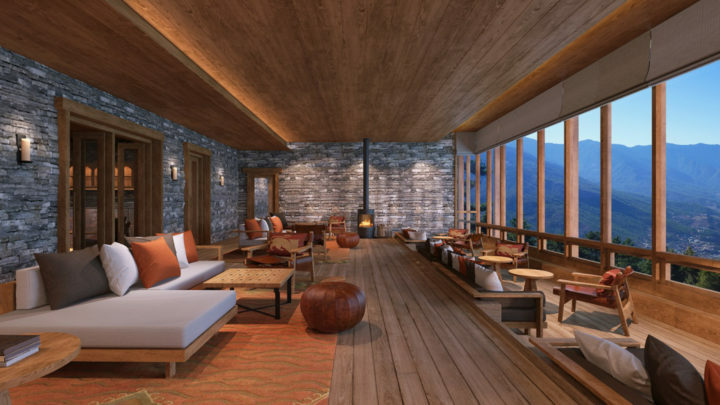 Opening in October and taking reservations for November and beyond, Six Senses is opening lodges in Thimphu, Paro, and Punakha, with plans to open Gangtey and Bumthang resorts in early 2019. Collectively they will span key areas of the country with some 82 suites and villas to create a full and immersive experience of Bhutan. The Six Senses Thimphu, the largest of these boutique lodges, is located in Bhutan’s capital city — so far, the only capital in the world without any traffic lights. It’s a peaceful city where traffic jams are only a vague idea, usually uttered from awed visitors when experiencing the contrast from their own places of origin. Thimphu is also the seat of Bhutan’s much-loved monarchy. Six Senses Thimphu places strong emphasis on the spirit of strength and sky with grand architectural elements suggesting the magnificence of dzongs (royal fortresses). It referred to as the Palace in the Sky. 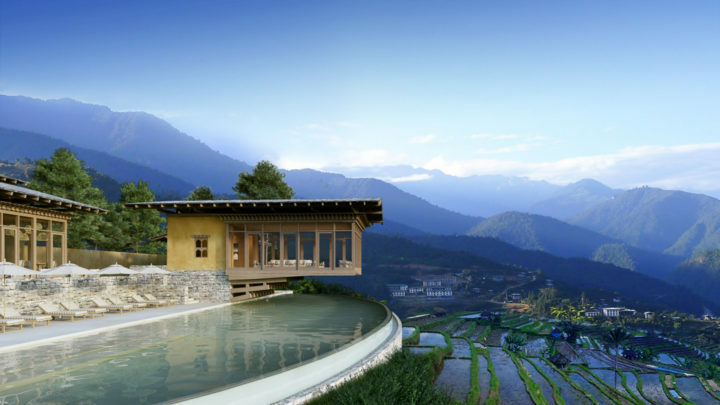 Six Senses Paro, in a western valley of Bhutan, draws in the ancient ruins of a dzong fortress. Paro, an hour’s drive from Thimphu, is the location of the kingdom’s international and only airport, which was recently expanded and handled some 314,069 travelers last year. Paro is also the jumping off point to the Tiger’s Nest Monastery. The iconic landmark hangs on a cliff above an enchanting forest of blue pines and rhododendrons and makes a worthy trek for more active travelers (a pony can be arranged most of the way for those who prefer not to do the 3,000-foot climb) on a trail that “crosses a chapel of butter lamps and descends to a waterfall by the Snow Lion Cave,” by one account. The view of the Paro valley from there is one to behold and is said to be the place where Buddhism first entered Bhutan. Guests can take a morning dip in the infinity pool overlooking the valley, often shrouded by morning mist, and then engage in a hike to the 17th century Chorten Ningpo towards Khabasa Village, where they might visit an orphanage and educational institution. On the way back they may visit the Punakha Dzong and suspension bridge over the meeting of Pho (father) Chhu (river) and Mo (mother) Chhu in the Punakha-Wangdue Valleys, then return to the lodge for meditation and late afternoon relaxation. 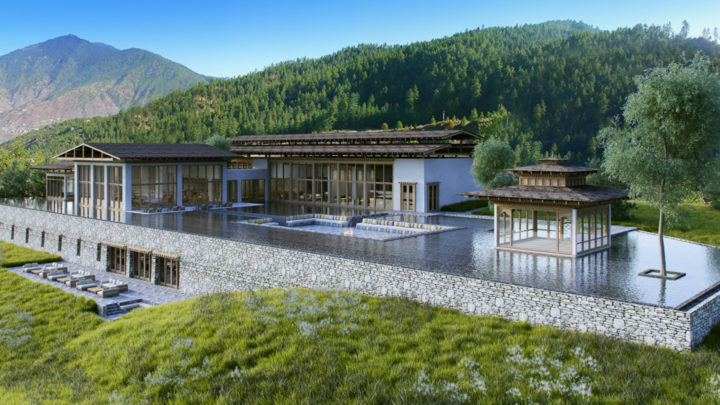 Each Six Senses Bhutan location will have its own spa and wellness center with a meditation room and outdoor pool. Spa design and treatments will center around local landscapes, traditions and remedies. Bhutan loves its festivals and has many of them throughout the year to celebrate its history, its religious leaders, its masterful traditions, its seasons, its wildlife, its food. The calendar lists some 80 festivals during the year. By all chances, whenever one might choose to visit Bhutan there will be a festival happening somewhere. Many of these celebrations are Tshechus, or yearly religious fests held in each district to honor Guru Rinpoche (Padmasambhava), who brought a Tantric form of Buddhism to Bhutan in 8th century. Those who witness a Tshechu are thought to earn merit, be bestowed great luck, and will have their wishes granted as sacred deities are invoked. The farthest distances between locations might be within 300 miles. However, the National Highway is the only main road running west to east and it winds its way up and down mountains, across bridges, along the side of cliffs and over high mountain passes, making for a grand scenic adventure in its own right. This springtime celebration in the Rinpung Dzong is a large and most vibrant of festival in Bhutan. People from Bhutan’s various districts join in and take blessings and the Cham Dances (masked dances) go on for days. On the final day, monks parade a throngdrol painting to all who care to behold it. Tradition dictates that seeing the throngdrol cleanses the viewer of past transgressions. The fall season Thimphu Tshechu is the biggest festival in Bhutan. In fact, the festival is now observed as an official holiday so that everyone can take part. Monks perform Cham Dances, such as the Zhana Nga Cham (Dances of the 21 Black Hats), the Tungam Cham (Dance of the Terrifying Deities) and the Durdag Cham (Dance of the Lords of the Cremation Ground). Travelers meander amid local food stalls and craft sellers. The Black Necked Crane Festival is also celebrated during the autumn season to remind people to honor nature. The precious Black Necked Crane is an endangered bird that is found in abundance in Bhutan during this season, especially in the Pobhjikha Valley (future region of Six Senses Gangtey, to open in 2019). Children from different schools perform dances and skits. The Haa Summer Festival in July is less about deities and more about delights as travelers amass from all over the world to eat authentic food cooked by the locals, watch religious processions, dance, and sing with the locals. They may take part in a photography competition or enter a challenging mountain bike race. The Haa Valley is located some 2 hours by car from Paro Valley through Bhutan’s highest road pass. This autumn festival focuses on traditional and mask dances performed to honor Guru Rimpoche and to celebrate the establishment of the Jambay Lhakhang Monastery in Bumthang (location of the future Six Senses Bumthang to open next year). The festival features a fire ceremony called Mewang, which is considered the highlight of the celebration. During this ceremony, locals run through a large flaming gate made from dry grasses. Other rituals include the Tercham (Dance of Treasure), where masked dancers perform naked in the middle of the night. This dance is believed to bless infertile women and help them to bear children.